New Zealand is a more popular travelling destination than ever as the world discovers what the Kiwis already know to be true. Here you’ll find dazzling beaches, pristine turquoise lakes, spectacular mountain views, volcanic geothermal springs and over 250 well maintained camping areas. If your first road trip is through New Zealand, you’ll be setting the bar very high for any trip to match! Whether you’re a local youngster heading out on the road for a gap year or a tourist flying halfway across the world to experience New Zealand, read on. You’ll learn how to plan a one-of-a-kind trip by seeing the country the way it should be seen: with the freedom of your own wheels. Some of the things you want to consider when planning your trip are whether you will be sleeping in a campervan or tucking up in a tent. A fully equipped campervan comes with many amenities such as a bed, storage area, kitchenette with sink and gas cooker, a fridge and power plug-ins. So generally speaking, you will have almost everything at your fingertips, making your trip close to hassle-free. Whether you’re on a family trip, or out with your best buddy, we’ve got a detailed campervan packing list here. Swimwear – there are many fabulous beaches and hot springs, so you’ll want to take a dip at many points during your trip. Sunscreen – New Zealand has a mild, temperate climate that doesn’t get too hot or cold in most areas. That being said, you may burn faster than you expect if you’re new to the islands. Be extra generous with your sunscreen. Sandfly repellent – New Zealand has almost no natural predators. But if you plan on hiking in the forest, you’ll want a bit of sandfly repellent. They’re harmless little pests but the bites can be a nuisance if you run into them and you’re not prepared. These are the basics to get you thinking about what to pack before you hit the road. Consider what special activities you might be doing and plan accordingly. New Zealand has great ski areas, for example. There are also great caves for diving and beaches to explore. Come prepared and you’ll be ready for anything. The best time of year to travel New Zealand is in winter, hands down, June – August. The roads are quieter, the vans are cheaper and there should be more selection with pick up and drop off locations. Plus to top it off, if you love to ski or snowboard, as well as travel, what better way to tie your 2 loves together? Travellers Autobarn does offer heaters and water bottles for specific months of the years, so you won’t get cold. Autumn would be our second recommendation to travel New Zealand, March to May. With temperatures up to 29 degrees and you will still experience those long ‘summer-type’ days. This is also a cheaper time of year to travel as well, so if you’re trying to save on budget then make sure to look at these months! Spring, but specifically October is worth a checking out too! Prices are still sharp and the weather is starting to get warmer. Everything is more vibrant! Spring is generally known as the ‘waterfall season’ in New Zealand, so make sure you check them all out! Whale watching is starting as well, so if you love mother-nature and the great outdoors, Spring is your month. Finally, November to February are all great months to explore New Zealand. Summer is kicking in and the weather is improving. Although rates won’t be at their lowest, there will still be a deal to be had. Warm, long and sunny days make for a relaxing adventure, however you do risk hitting the crowds and busy roads! Kids will also be on school holiday for the majority of December – January. Drive on the Left Side of the Road – this one is laughable for locals, but for many visitors it is quite a surprise that New Zealanders drive on the left side of the road. Know the Speed Limits – the national speed limits are 100km/h (about 60 mph) on the open road, and it varies in urban areas. Speed limit signs usually have a red ring around the number. Consider the weather and drive accordingly. Don’t Talk on the Phone – It’s illegal while driving here. Don’t Drink and Drive – If you’re under 20 years old, you are not allowed any alcohol in your system. Over 20 and the cutoff is 250 micrograms per liter of breath. It’s hard to judge what that cutoff will mean for every individual, so play it safe by waiting until you’re parked for the night before drinking. Look Out for Animals on the Road – In rural areas, there can be springbok, sheep and other herds. Keep an eye out in rural areas. Take Your Time – the roads in New Zealand are winding and sometimes mountainous. This means it might take more time to get somewhere than you planned by looking at a map. One Lane Bridges – most bridges in New Zealand are one lane. As you approach the bridge, you’ll see a yellow sign that represents the bridge. There will be a blue sign underneath with two arrows. The bigger arrow gets priority. Who doesn’t love cooking in the great outdoors? Whether you’re cooking on an open campfire, or over your campervan stove, each meal really does feel special and like you deserved it. It can be a challenge to get cheap food while travelling around New Zealand, but as long as you plan and research it is possible to eat well while you’re out on the road. Cooking in your campervan means that budget and quality can come together, as long as you’re organised. Stock up on basic essentials such as rice, pasta, potatoes, veggies and fruits. Sauces and spices can also go a long way to jazzing up your meals. Fried eggs with Spinach, Mushroom & Cherry Tomato Fry-Up. Saute some onion and garlic in a pan before adding chopped mushrooms and cherry tomatoes. Add in the spinach and let it wilt before cracking in a couple of eggs. When the eggs are done take it off the heat and serve with crusty bread. Caprese salad. If you’ve been driving all day and feel like something lighter that requires no cooking then why not serve up a caprese salad. This simple salad is just fresh, ripe tomatoes and mozzarella. Drizzle with some olive oil, salt and pepper. Yum! Eat with olives and fresh bread. Classic Aussie sausage sizzle. Pick up some sausages, bread, onions and sauce. You can either cook these on a gas stove or a public bbq. Mac and Cheese. Super simple, super tasty and super cheap. You can either buy a box of the ready made stuff or cook some pasta stir in a simple homemade cheese sauce made from butter, flour, milk and cheese. Simple chilli. You can make chilli from as little as five ingredients – Garlic, tinned tomato, beef, kidney beans and chilli powder. Serve with rice, bread or tortilla chips. Veggie burritos. Simply pick up some tortilla wraps, canned corn, canned beans, red pepper, a jar of salsa, avo and cheese and you’re good to go! Pancakes. Easy to make and very easy to eat. All you need is eggs, flour, milk and a pinch of salt. Make these savoury or sweet – your choice! Campfire nachos. Who doesn’t love nachos, especially after a long day of swimming or surfing at the beach? Grab some corn chips, refried beans, cheese, salsa, sour cream and jalapenos and get cooking. If you’re renting a campervan and it’s a self-contained unit, check with us to see what is included, so you know if you need to bring any other essentials. Vehicles are often outfitted with a standard kitchen with a fridge, microwave, cookers/burners, a sink, and cupboards. Travellers Autobarn do offer a kitchen kit as well, in our premium living equipment set. Camping on private property is illegal. Leaving behind litter or human waste at any campsite is illegal. The emptying of onboard toilets is only permissible at legal dump stations. These are often found at holiday parks. Guests must have their own waste systems, toilets and fresh water unless those amenities are provided by the campsite. Don’t be a nuisance (respect the rights of others and don’t be too loud). In addition to the many public lands of New Zealand, the Department of Conservation provides over 200 public campstes which can be searched here. This search engine allows you to filter campsites by region, landscape, facilities provided and access. Also, read up on your rights and responsibilities with this article about the Freedom Camping Act 2011 from Trip Savvy. Traditional camping: Here is when you pay per night for a site, based on your vehicle size and number of travellers. You’ll have access to a terminal and you can recharge your campervan, dump out your waste, water, and fill your tank with fresh water. DOC Campgrounds: These are sites managed by the Department of Conservation, mentioned above. They are quite quite basic but special, as they’re usually located near lakes, rivers, oceans or in beautiful forests. They’re quite popular so try and book ahead. Freedom Camping: If you’re in self-contained vehicle, with a toilet and shower, you can camp pretty much anywhere in the countryside. However, you must comply with any rules of the area and leave no trace that you were there. For even more articles and blogs on freedom camping, click here. That’s it, once you’ve got all the basics covered, it’s now time to plan your route! We give you our top 5 beaches you need to visit when in New Zealand, whether you’re camping or in a campervan, these spots should be on your list. Coromandel Peninsula – This peninsula in the northeast is famous for beaches that frame picturesque coastal scenery and forests you could spend days exploring. Visit Thames, a small city with a rich history of gold mining. Then go to Hot Water Beach and dig your own hot pool that fills from springs beneath the sands. Camp at Fletcher Campsite in Northern Coromandel, a beachfront campsite with a farm setting. Rotorua – It would be amiss to write a New Zealand travel guide and not mention the geothermal experience of Rotorua. On the fringe of New Zealand’s volcanic Central Plateau lies Rotorua, a place that has attracted tourists since the 1800’s. Located here is the world’s largest geothermal hot spring and also the remains of the 8th wonder of the world. Rotorua is a 3 hour drive from Auckland. It’s the main point of Maori tourism in New Zealand, so open your arms to total cultural immersion. Aroha Island – This is a small island about 12 km by road from Kerikeri in the Bay of Islands, Northland, NZ. It is linked to the mainland by a causeway and boasts an impressive population of Brown Kiwi. Awaroa, Tasman – This beautiful spot is known as the “People’s Beach” because a group of New Zealanders worked together through crowdsource funding to buy it for the country. Turquoise waters, golden beach sand and lush, natural green bush makes this national treasure a little piece of paradise. The nearest DOC campground is an hour and a half hike away at Totaranui. The beauty is worth it, though it may not be a trek for the faint of heart. The Catlins, Otago – Porpoise Bay is a step back in time. Located at the most southern point of South Island in a remote area between Dunedin and Invercargill, it feels like you’ve gone back in time. Mobile coverage is sketchy and there are limited ATMs, but the reward is a cavalcade of beautiful beaches. Porpoise Bay is known for sighting rare Hector’s dolphins, New Zealand sea lions and yellow-eyed penguins. There’s a campsite between Porpoise Bay and Curio Bay. One of the great things about New Zealand beaches is that even touristy spots seem vacant to international beachgoers. If you want access to truly off-the-path, unspoiled beaches, then ask some friendly locals or the Travellers Autobarn team. Recommended Roadtrip: Auckland to Christchurch! Finally, we give you one of the best road trips you can do in New Zealand: Auckland to Christchurch. A drive from the capital city at the topmost part of the north island, to Christchurch, the biggest city on the south island, it is a great way to hit the highlights of New Zealand. You’ll want to take at least 9 days to enjoy the trip! Day 1: Arrive in Auckland, pick up your vehicle rental and relax. Day 2: Explore Auckland and the surrounding area. Day 3: Drive south through the rich farmland of Waikato. Day 4: Spend the day at Rotorua! Enjoy nature or check out the adventure park. Day 5: Drive toward Wellington. This is a very scenic stretch of the trip! Day 6: On Day 6 you will cross the Cook Strait on the Interislander Ferry. Day 7: Drive to the picturesque seaside town of Kaikoura! Day 8: Continue south through the countryside to Christchurch. Day 9: Explore the dynamic city of Christchurch! We hope this has been an inspiring guide for ideas of what to do on a road trip around New Zealand. For more in-depth guides, or for even more road trip itineraries come and explore today. Are you thinking of visiting New Zealand? Renting a campervan or car hire? Wondering where you’ll go on that trip of a lifetime, what sights you’ll see and places you’ll stay? Well we want to make that trip a little easier and cheaper for you, by teaching you the tricks of the trade to Freedom Camping in NZ. What is freedom camping in New Zealand? What are the rules of freedom camping in New Zealand? What is a self-contained vehicle? How do you find the best camping spots? What are the best apps for freedom camping? What are the 5 best freedom campgrounds on North Island? What are the 5 best freedom campgrounds on South Island? Freedom camping often entails camping outside of recognised campgrounds on public land or using campsites specially designed for freedom campers. Families and adventure lovers alike appreciate freedom camping because of the quiet and unobstructed views it affords. There are frequently no other campers right on top of you to keep you up at night or wake you up in the morning. You can laugh, sing, and talk as you like without disturbing others too. As these spots are usually quieter than your normal paid campgrounds, you can enjoy 180-degree views or better of some of the most stunning terrain in New Zealand. This is ideal for stargazing and if you’re into your photography. It can be like having your own campground all to yourself! Some freedom camping locations are truly free, in that they don’t cost anything. Others charge a fee, albeit usually a small one, but you are not restricted in the way you would be in a family holiday camp or RV park. Instead, you can park in out-of-the-way locations because you don’t need to be hooked up to an electrical or water connection (but more on that below). You see more of nature and can come and go with ease, covering lots of ground without having to spend hours “decamping”. Whilst freedom camping NZ sounds very… well, free, there are a few rules to follow, so that everyone has an enjoyable experience and you don’t wind up paying fines for camping how and where you shouldn’t. It’s worth noting that fines for violating camping rules can be quite steep. You don’t want to run afoul of the law or ruin freedom camping for others by flouting the rules. The first rule is that most of the time, you will be required to be in a self-contained vehicle, sometimes called a self-contained camper or a campervan, which fortunately, is easy to rent in New Zealand. You can learn more about self-contained vehicles below, but know that using one of these campervans lets you camp on Department of Conservation (DOC) land and district council land, provided you are not breaking any rules for the area (length of stay, distance from town, etc.). Although tents and non self-contained vehicles are allowed in some locations, many spots are restricted to all but self-contained vehicles. You can ask any local information centre (a.k.a. i-SITE) or DOC visitor centre about their specific rules for the area in which you wish to camp. Sometimes you can find this information online as well. Never camp on private land or on district council land that specifically forbids camping. Use only the toilet in your campervan or a public toilet. Do not use nature as your personal toilet. Be cautious when lighting fires. Never leave a fire unattended, and be sure to douse it completely when you’re through. Be aware that in some high-risk areas, fires are completely forbidden. Use designated rubbish bins, or take any trash with you. Always pack out what you bring in. Use recycling facilities when possible, rather than putting recyclable items in a bin. Empty your campervan’s toilet and waste water only in designated areas. Never dump your waste products in the wilderness. Be mindful of noise if near other campers or residential areas. Leave as little evidence of your camping behind as possible. A self-contained vehicle meets specific standards that make it environmentally friendly and allow you to camp without having typical campground public facilities nearby. It must have fresh and waste water storage for at least three days, a toilet and a lidded rubbish bin for all your refuse (wrappers, food waste, etc.). Self-contained vehicles in New Zealand are marked with a “NZS 5464” sticker that means it meets Caravan Self-Contained Certificate standards. More fun, however, are the perks that come with a self-contained vehicle. These spacious vehicles typically sleep multiple people and contain equipment for cooking and food preparation, like a sink, gas cooker, small fridge, and even a microwave. There are places to plug in small electronics, so you can have light and charge your phone or camera. Everything is very efficient, with a remarkable amount of storage and comfort for your trip. There are drawers and cabinets for your belongings and convertible tables and benches for eating, lounging and sleeping. You’ll be amazed at what you can stow in your self-contained vehicle. You drive, cook, dress, and sleep in the same vehicle, which saves a lot of hauling gear, tent pitching, and other camping prep that can take the fun out of the experience. Also, your campervan provides better shelter from inclement weather than a tent, and should a rainstorm come up, all you have to do is pop inside for a hot cup of tea and a game of cards. On chilly mornings, you’ll appreciate being able to sleep until sunrise without the cold ground under your back. Travellers Autobarn makes self-contained vehicle rental super easy. You can even be as young as 18 years old to rent a campervan, and the bond system is quite reasonable. You can select from several levels of liability, and the funds are simply frozen, not deducted from your account. Campervan rental fees are cheaper out of Christchurch, too, so keep that in mind when you’re making plans. If you’re looking for the most gorgeous spots for freedom camping, there are tonnes of terrific resources. First, decide where in New Zealand you want to camp. If you’re not a native kiwi, you may not have realised just how large the country really is, spread across two main islands. You’ll want to calculate the distance between destinations, taking into account rough terrain, weather, road incidents, and closures. Let’s say your bucket list includes “camping New Zealand North Island.” You can use one of several excellent maps, like this one from New Zealand.com, to zoom in on areas that look appealing to you, based on activities you enjoy, beaches, mountains, volcanoes, and the like. Check with the New Zealand Department of Conservation to make sure that any conservation land where you might want to camp is not prohibited (restricted to self-contained vehicles is okay if you have a certified campervan as discussed above). The DOC manages the National Parks for the country of New Zealand, so if you want to camp in one of those parks, that’s an ideal starting point for research. Travellers Autobarn offers free, handy downloadable guides with input from us, which can help you plan a road trip, even in the wintertime. We also include popular itineraries, so you don’t have to reinvent the wheel. And Travellers Autobarn is available by phone, too, should you have any questions. Of course, in today’s high-tech world, there are also apps to help you find ideal camping spots, whether you’re free camping South Island NZ or free camping NZ North Island. It’s worth noting, though, that not all camping apps are encouraging or inclusive of freedom camping. Some are more focused on holiday parks and family campgrounds, which aren’t really for the freedom camper. Fortunately, there are free camping apps that are ideal to find more remote sites. CamperMate is a popular app that provides data on a wealth of camping elements, collected from users around New Zealand, so it’s full of insider tips and tricks. There’s an Android and an Apple version, and new locations and information are added daily. Campgrounds for self-contained vehicles have their own section, and you can look up things to do and hidden secrets, as well as get area road warnings. There’s an online map for advanced trip planning, too. Rankers Camping NZ app is perhaps even more widely used. With iPhone, iPad, and Android versions, one of its biggest selling points is its offline freedom camping New Zealand map system, which frees you from New Zealand’s poor Internet and lets you use the app virtually anywhere. Travellers Autobarn also have a free app, which hosts an abundance of information from campgrounds, things to do, where to locate ATMs, find the closest petrol station, and much more. It is available to download from Google Play and iTunes. From holiday parks to isolated sites conducive to freedom camping, these apps will help you find it all, along with rules, restrictions, photos and reviews. The photos really help you find the campsites with the best views, so you know what to expect in advance. Whilst beauty is in the eye of the beholder, and there are hundreds of lovely campgrounds on North Island, here are five highly ranked spots you might want to check out. Are you an avid birder? The Rotokare Scenic Reserve may be the perfect freedom camping spot for you. This scenic reserve has spent millions of dollars eradicating pests like weasels, stoats, and rats from its confines and has enclosed the reserve with a predator-proof fence, which has allowed bird species to repopulate. A small donation is requested of each camper per night to offset costs of running the reserve, but users find it worthwhile paying. Self-contained vehicles can park in front of the estuary. No dogs are permitted in this wildlife sanctuary. Campers love the view at this location. At the beach itself, there are swimming and fishing areas, although you do need to take care with the currents. Whilst there are parking areas limited to freedom campers in self-contained vehicles only, you’ll find family campers using the facilities nearby. There’s something for everyone here with dolphins jumping within view, small caves to explore, and a sandy stretch of beach to walk. You’ll catch fantastic sunsets in a tranquil location at the Tuapiro Reserve, and it’s absolutely free to camp there. Enjoy the water views and bird life, including black swans. Users love the options for picnicking, kayaking, and fishing. This is a popular camping site for dog owners, too. If you enjoy trout fishing, this is a great place to stop and camp. You can park quite close to the water much of the year. There are bathrooms and a cold shower nearby, although the bulk of the overnight traffic consists of self-contained vehicles. Campers at Lake Aniwhenua report no fee assessed for any type of camping. Families with children like the gentle terrain around the lakeside and the serenity of the waterside. Another bird-watching paradise, Mohi Bush is a small campervan turnout area in the Hawkes Bay area near Maraetotara Falls. It’s a great spot to stop for a quiet night’s rest and to hike the area for nature appreciation before heading to the falls. Try to reach it before sunset, though, as it can be a bit hard to find in the dark. Like the North Island, South Island is full of amazing freedom camping spots. In fact, South Island is where freedom camping really takes off, with dozens of beautiful and exciting spots to pick from. Here are five picks for favourites to consider. Visitors rave about the gorgeous views at Lake Pukaki, and this area at the side of the lake is limited to self-contained vehicles only, as there are no facilities. You’ll love the turquoise waters and snow-capped mountain vistas, and it’s no wonder this stop gets consistently top ratings on the Rankers app. Other attractions here include wonderful stargazing without city light, gorgeous sunrises and sunsets, and fishing close by. It’s mostly very still, but when it gets windy, it can be extremely chilly, so pack extra layers of clothing and warm bedding just in case. Wellington is New Zealand’s capital city and is located near the southernmost point of the North Island. It’s a quirky and creative city with a strong art scene and a good dose of coffee and craft beer culture. About 30 minutes from Dunedin along a spectacular drive, Long Beach is known for rock climbing and cave exploration, among other attractions. The sandy beach offers views of penguins and seals and is gentle enough for swimming. You’ll only find other freedom campers at Long Beach Domain, as it is restricted to self-contained vehicles only. With a large grassy area for ball playing and nearby picnic tables, campers find it idyllic. Campers report the entrance sign can be tough to see, so keep your eyes peeled. Tree lovers will adore this well-shaded camping site with picnic tables, plenty of space for parking, and tranquil walks through the plantings and flowers. This freedom camping spot is in the far southern end of South Island, so it’s a place to stop if you’re doing an island loop. Fires are prohibited, but pets are allowed, and there is no fee to camp there. For free camping overlooking Ohingaroa Bay, this camp spot can’t be beat. Stays are limited to two nights maximum, and the camping is restricted to-self-contained vehicles only. There is boat access as well, which makes the site popular with water sports enthusiasts, so get there early to get one of the four available spots. Users rave about the clear skies at night and the quiet there, even though it’s close to the road. You can go for a swim and then savour the sunset if you’re lucky enough to snag a spot. This is a special place that has been lovingly transformed alongside the shore of Lake Monowai. Known as one of the most isolated campsites in the South Island, Monowai is a spot you must visit. Located in Fiordland National Park, enjoy the lake, many walks, fishing and boating options available. This really is a freedom camping spot that should be on your bucket list. Freedom camping can be one of the best ways to experience the wonders of both North Island and South Island in New Zealand. If you plan well in advance, observe the rules, and make sure you are in the proper vehicle, such as using self-contained vehicles where they are required, you’ll see sights that will amaze and delight you. Whether you’re looking for freedom camping Christchurch rentals or freedom camping Auckland assistance, Travellers Autobarn is here to help you. Contact Travellers Autobarn today to make your reservation and book the campervan that’s right for your trip of a lifetime. To put it simply, any time of year is a great time to travel New Zealand in a campervan. Speak to the team at Travellers Autobarn for more information and to book your campervan today. We look forward to welcoming you on the trip of a lifetime! Why should you consider camping in Winter? If you prefer solitude and peace and quiet to crowds of tourists, winter is definitely the time to explore New Zealand. While there are plenty of places you can go to escape the crowds even in peak season, in winter, you can drive for miles without seeing a single other car or campervan on the road. You can enjoy stunning empty beaches and landscapes without a soul in sight. You also won’t need to book ahead at popular campsites so you have more flexibility – you can just turn up as and when it suits you. Popular skiing locations will obviously be at their busiest times in the winter, but you’ll feel as if you have the rest of the country to yourself. It really is the ultimate wilderness experience! Talking of stunning landscapes, you’d be hard pressed to find a prettier time in New Zealand than the winter months. Snow on the mountains makes for amazingly beautiful views and photographs that are sure to make your friends and family back home jealous. Travelling in the off-season means you can take advantage of cheaper rates. Renting a campervan is cheaper for a start, with prices as low as $29 a day between May to September. This means your money goes a lot further and so you can stretch out your road trip for longer – hurray! You can also treat yourself to a night or two in a hotel along the way if you’re craving a little luxury. Hotel rates drop in the winter along with everything else. Now that you realise winter is most definitely the best time for a campervan holiday in New Zealand, you can start planning your trip. Wanaka on the South Island has some great winter activities on offer including dog sledding and snow and ice driving experiences. Queenstown holds a four-day winter festival that’s well worth a visit if you’ll be around at the end of June. With live music, street parties, and mountain races, there’s something for the whole family to enjoy. Tekapo Springs in Christchurch is a must-visit for adrenaline junkies of all ages to try out the snow tubing on a 150-metre downhill slope. For a more sedate activity, you can relax in the natural hot pools with stunning views of the Southern Alps. Kaikoura is a haven for animal lovers. It’s one of the best locations in the country for whale watching. Their migration period falls in June and July so you’re more likely to catch a glimpse of a humpback or blue whale. There’s also a seal colony at Kaikoura Peninsula, just south of the town. The Franz Josef Glacier is at its best in the winter months. There are plenty of hiking opportunities on the glacier itself or up to the vantage point of Alex Knob. Skiing is, of course, a must-do activity during the New Zealand winter. There are plenty of places to hit the slopes, with most of the ski areas found on the South Island. Cardrona Alpine Resort in Wanaka is one of the best resorts for family skiing and offers child-friendly slopes, ski school, and childcare options. Powered campsites are a must during the winter months so you can run a heater and stay toasty warm inside your campervan. The best campsites offer a combination of a beautiful setting, convenient location, and great facilities. Of course, you want to plan your trip around the places you want to visit, rather than choosing the best camp sites, but it’s helpful to know what the best options are for bedding down for the night in the area you’re travelling to. Within easy walking distance of the town centre, this campsite offers powered sites with great shower and kitchen facilities, Wi-Fi, and even a playground for the kids. Only a couple of minutes from the lake and a 10-minute walk into town, the location of this campsite can’t be beat. The spacious grassy powered sites are serviced with full amenities including toilets, showers, kitchen, a children’s playground and small petting zoo. After a busy day of sightseeing, you’re sure to appreciate the thermal pools and swimming pool that are free for campsite guests. What more could you ask from a camping spot? Other facilities include a BBQ area, children’s mountain bike track, playground, TV lounge, laundry, kitchen, and shower block. Download the full guide for more top campsites. Dotted all around New Zealand are “freedom” camping spots that allow you to park up and stay the night for free. These camping spots don’t usually have any facilities such as toilets, and you’ll need a blue “self contained” sticker on your campervan to be eligible to use one. Travellers Autobarn offers self-contained vehicles that meet this requirement. It’s important to use one of the designated areas and not just stop your campervan wherever you want. Even if you’re in a remote location and think you’re not bothering anyone, you can be fined for camping in a restricted area. These fines were put in place in 2011 to protect the environment. To find out where you can camp for free, you can use the official NZ camping map app, which includes over 500 free camping spots on both the North and South Island. You can install this handy app on your phone and the maps even work offline so you’ll be able to find somewhere to camp for the night, wherever you are. Packing for your first campervan holiday can be a bit overwhelming, especially if you’ll be travelling in winter, but there’s no need to get stressed about it. If you forget anything, it’s usually easy to buy while you’re on the road. Plenty of bedding – take an extra duvet or sleeping bag for those chilly nights. Lots of warm clothes – dressing in layers is best as the temperature can be quite changeable throughout the day. This gives you the flexibility to just strip off or add an extra layer. Hot water bottles – to keep you extra toasty in bed. Portable heater – will heat your campervan to a cosy temperature when you’re staying at a powered campsite. Snow chains – you might not need these, depending on your itinerary, but they’re a requirement for certain roads and mountain passes on the South Island in extreme weather. You can hire snow chains at the same time you pick up your campervan and remember to check the forecast before you go! Plenty of coins – most campsites have coin-operated laundry and shower facilities so you’ll need plenty of spare change to use them. Start stocking up on coins before you leave. Torch – a good torch or headlamp is essential for those late night trips to the toilet block, or if you want to conserve your campervan battery by not turning on the lights. Make sure you have spare batteries too. First aid kit – including bandages, Elastoplast, antiseptic cream, painkillers, bite cream, diarrhoea medication, etc. Insect repellent – mosquitoes and sand flies aren’t so much of a problem in winter but it’s best to be prepared. Music – most rental campervans come with a stereo. Make the most of it and create a road-trip playlist that will help you to remember your adventure every time you hear it in the future. Books – you’re unlikely to have internet access everywhere you go and the internet at campsites can be painstakingly slow. Instead of getting frustrated, enjoy the opportunity to curl up with a good book instead. See the end of this guide for some helpful book suggestions. Food – stock up on packet pasta and noodles for when you need a quick and easy meal in the middle of nowhere. Hiking boots – the best of the country is off the beaten track so be prepared to do some walking to see it. The climate is mild on the North Island in winter. Temperatures in Auckland are usually between 9 and 15°C. The scenery on the North Island isn’t any less impressive in winter and while it will be too cold to swim in the ocean, there are plenty of natural hot springs to enjoy. The “Thermal Highway” runs from north to south along some of New Zealand’s most interesting volcanic sites, including the Rotorua geysers and the Lake Taupo crater. These places are not only great fun to explore and to get some amazing holiday snaps, but they’re also a great educational opportunity if you’re travelling with kids and trying to squeeze in some “road schooling”. There’s also the Hobbiton movie set at the start of the route, which is a must-stop for Lord of the Rings fans. For the grown-ups, this route also includes some of the island’s best wineries, so you can relax and explore with a drink or two. Plan around two weeks for the whole trip, with plenty of stop-off. The 150 km “Forgotten World Highway” is a driving experience to remember (although perhaps not for the faint of heart! ), with roads passing over mountains and alongside river gorges. Taumarunui is a friendly town with plenty of shops, accommodation, and eateries. There’s so much to see along the way including Damper Falls, the Whangamomona Saddle, and the enigmatically named “Bridge to Somewhere”. Plan three days for this trip and use Stratford as a base for exploring Mount Taranaki and Egmont National Park. Download the full guide for details on the Pacific Highway roadtrip! The South Island is arguably at its best in winter when its impressive mountain ranges are capped with snow. Expect the weather to be chilly (but the scenery more than makes up for this) but there are still places on the South Island with a mild winter, such as Nelson, which boasts the highest annual amount of sunshine in the country. The stunning drive from Queenstown to Milford Sound is considered by many to be one of the best road trips in the world. You’ll pass through snowy landscapes, majestic mountain ranges, and ancient rain forests. The full drive is around eight hours and is best split over a few days with stops for attractions like the mirror lakes and the Fiordland National Park. This road trip takes you through some of the best that the South Island has to offer in winter with plenty of opportunities for skiing, snowboarding, ice skating, hiking, and relaxing under the stars. Along the way you can visit must-see tourist spots including Wanaka, Lake Tekapo, and the Fox and Franz Josef glaciers, all which offer some of the country’s most stunning scenery and are particularly spectacular in winter. Plan around 10 days for this trip, which is enough for a few days to explore all Queenstown has to offer, with a day or two spent at other spots along the way. Download the full guide for more roadtrips. New Zealand is famous for its sweeping landscapes and beautiful wilderness locations, but it also offers exciting metropolitan cities. Balance out your campervan trip by spending a few nights in the city in between exploring the countryside. You’ll also find, cities have some of the best-equipped campsites and, of course, a great opportunity to stock up on supplies. Auckland on the North Island is the largest city in New Zealand. It is also an international flight hub so there’s a good chance your holiday will start off here. There’s lots to see and do here, including museums and art galleries, parks, and of course many world-class bars and restaurants. Wellington’s attractions include Oriental Bay – the city beach, and plenty of opportunities for walks and outdoor activities. Food is also king in the city with many restaurants, food trucks, and night markets. Christchurch suffered massive damage from the earthquakes in 2010 and 2011 but its spirit has not been broken. Most of the original attractions are still standing or have been re-built. The Botanic Gardens is definitely worth a visit and a ride on the Christchurch Gondola will take you to the top of Mt Cavendish for a bird’s eye view of the city. Queenstown on the South Island is a popular hub for adventure sports all through the year, including sky diving, bungee jumping, and white water rafting. In the winter months, skiing is the main attraction and the town celebrates the start of the season with their four-day winter festival. Nelson is a small city but it’s worth a mention as it’s so popular with visitors for its laidback vibe and sunny climate. The region boasts a long history of creative culture and it’s a great hub for exploring the surrounding areas such as Kahurangi National Park, the Abel Tasman National Park, and Golden Bay. To drive a campervan in New Zealand, you’ll need an international driving licence, which you must keep with you while driving. The legal driving age in New Zealand is 18 and you can rent a campervan from this age too. Drivers in New Zealand drive on the left side of the road, which can take a little getting used to if you’re from a country that drives on the right. As some of New Zealand’s quieter roads are almost empty of traffic in the winter months, it’s not unknown for visitors to drive for several kilometres on the wrong side of the road before they realise their mistake! Driving in winter can be more hazardous, especially on the South Island where snow and ice can make the roads slippery. You might need snow chains for some of the more remote mountain roads in winter. Road safety in New Zealand is generally very good and roads are usually closed when snow starts to pose a safety hazard. It’s best to research the route you plan to take by consulting guidebooks and searching online before you set off. Some roads are unsealed, which require careful and slow driving. Steep and winding roads can also be difficult to navigate for inexperienced drivers. Your insurance may not cover driving on unsealed roads so make sure to check this before you plan your route. In this guide we run through some of the best trips in the North and South Island as well as top do’s and don’ts for road trippin’ in New Zealand. Download the full guide to get all the road trips. The South Island of New Zealand is famous for its staggeringly beautiful mountains, lakes and glaciers. The South Island is the largest of the two islands and is bordered by the Cook Strait in the north, the Tasman Sea in the West and the Pacific Ocean in the South and East. Here are three great routes you might want to consider: if you’re doing a round trip then this is a great opportunity to see more of the South Island! A campervan road trip is the best way to make the journey from Christchurch to Dunedin on New Zealand’s South Island. This trip can take you as little as five days or you can take things at a more leisurely pace to stretch it out over several weeks. Once you’ve picked up your campervan in Christchurch head southwest through the green Canterbury Plains. If you opt for State highway 72 then you’ll find yourself on the Inland scenic route. There are lots of great places to stop and explore on the way such as the Pleasant Point Railway or the Waimate Walkway. After you cross the Raikaia River, known for its salmon fishing, pull up the campervan and stop at Methven, a local Ski town. This is a great place to grab a coffee, take a hike or hire a bike. Next stop is Lake Tekapo, this stunning turquoise lake is amazing to see in person, during the day and the night. When the sun goes down this is the perfect spot for stargazing. If you want to stop for the night then there are a number of great campsites nearby, try to book one that’s on the harbour or nearby the beach. Dunedin is another 3.5 hours from here, so when you’re done soaking up the once in a lifetime views and scenery hop back in the campervan and hit the road. The second route we’re going to recommend keeps you close to the coast and takes you via Timaru and Oamaru. Once you’ve left Christchurch the first main stop is Timaru, located in the region of Canterbury. Once you’ve set up camp why not go for a dip in nearby Caroline Bay or try cooling off in the beautiful botanical gardens. If you are looking for some culture then take a trip to the local museums, they are home to some amazing Maori or Polynesian artefacts. The next stop is Omaru via Aoraki Mount Cook, this is New Zealand’s highest peak and is truly a sight to behold. Spend a few hours hiking and taking in the breathtaking views. When you arrive in Omaru, get ready to make some furry friends! Omaru is home to a natural colony of Blue Penguins, the smallest penguin in the world. If you can bring yourself to say goodbye to your new furry friends then the coastal city of Dunedin is only a short 1.5 hour drive away. If rural New Zealand is your vibe then you can skip out the stops in the north of the South Island and head straight to Middlemarch. The slow pace of life, stunning landscapes and wide-open never ending sky will make you fall in love with this area instantly. This is the perfect place to park up the campervan, catch your breath and just enjoy your amazing surroundings. If you’re a fan of The Hobbit then make sure you check out Rock & Pillar Mountain, featured in the movie. Top things to do in the Middlemarch area include bike rides, hikes and Sutton Salt Lake. The drive to Dunedin will only take you an hour from here, and when you arrive there is plenty to do. This is the country’s first city, which means there is history on every corner. Things to do include taking a tour of New Zealand’s only castle, Larnach Castle, strolling the boardwalk on Aramoana Beach or visiting the nearby Octago Peninsular for scenic views and local wildlife. Download the full guide for three more unmissable routes from city to city. For more inspiration check out our YouTube channel! 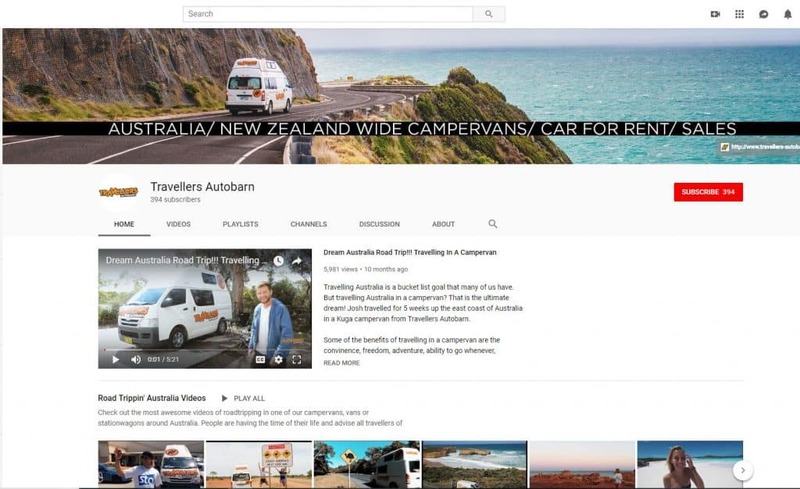 Search for Travellers Autobarn on YouTube. What the North Island lacks in size it makes up for in natural wonders. It’s famous for its volcanic activity, magnificent national parks, and with a larger population it’s also home to Wellington and Auckland, two vibrant and cosmopolitan cities. This memorable road trip takes you to some of the North Island’s most desirable destinations. Start the trip by hiring a campervan in Auckland. This northern city is infamous for its iconic Sky Tower that offers views of the Viaduct Harbour and the cityscape for as far as the eye can see. When you’ve finished exploring the city the first leg of this trip takes you on a two hour drive south to Coromandel. The Coromandel region is renowned for its natural beauty, green pastures, misty rainforests and pristine golden beaches, The Coromandel is blessed with hundreds of natural hideaways, making it an ideal place to escape. A must visit is Hot Water Beach… a beach with naturally heated hot water springs. When you’ve finished having fun in Coromandel then you’re going to head south in the direction of Rotorua. Don’t miss the absolutely stunning Redwoods forest that’s 20 minutes from the city centre. If you’re into mountain biking then you’ll love this place! Rotorua is a geothermal hotspot, which means this is a great destination to visit natural hot springs, bubbling hot mud pools and geysers! This road trip then takes you west along the SH 5 for 2 hours, to Waitomo. Here lies the small village, known for its extensive underground cave systems. The name Waitomo comes from the Maori word wai (water) tomo (hole). The caves are filled with tiny little glow-worms, unique to New Zealand. Their unmistakable luminescent light is a must see, you’ll feel like you’re in another world. Taupo is the next stop on your list. This destination is well known for being home to the largest freshwater lake in Australasia. The nearby Huka falls is another must see, it’s where the 200m wide Waikato River forces itself through a small 20m gap creating a stunning blue foam! It’s an amazing sight to see! If you’re a wine lover then we recommend that you hit up Napier before you pull into Wellington. Napier is home to some great wineries and picture perfect Art Deco style architecture. Last stop on this great North Island road trip is Wellington. The breezy drive south to your final destination takes you through the stunning Wairarapa scenery. If you can take the time to pull into the Mount Bruce National Wildlife Centre to see the world’s only white kiwi! At the bottom of the North Island, you will come to Wellington, New Zealand’s capital city. Discover New Zealand’s Maori roots in Te Papa, the Museum of New Zealand, or check out the cool shops along Lambton Quay. Once you’ve picked up your hired wheels, hit the State Highway 1 that takes you north. 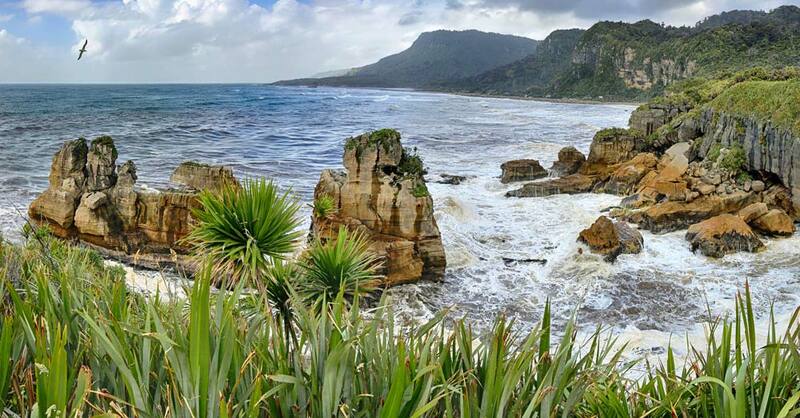 The long, sandy beaches of Waipo and Ruakaka make for a first great stop, or if you want to pick up supplies, food and coffee then pull into Whangarei and enjoy a few hours having a picnic or walking along the picturesque river basin. As you get a few hours north of Auckland you’ll notice a definite shift in pace as the laid-back vibes of the Northland take over. The must-see destination in this area is the famous Bay of Islands. The Bay of Islands is a subtropical micro-region known for its stunning beauty & history. For those that love hanging by the beach and water activities, it’s absolute paradise. Spend a couple of days exploring this area before packing up the campervan and hitting the road again. Another highlight of the North Island is Doubtless Bay. This large coastal area encompasses the distance from Mangonui, through to Coopers Beach, Cable Bay, Taipa and then out along Karikari Peninsula. You can’t end a road trip to the top of New Zealand without a visit to Cape Reinga. This is not only the place where the Tasman Sea meets the Pacific Ocean and the currents collide, but it’s also an important place in Maori spiritual traditions. Don’t leave without stopping by 90 mile beach, (in reality it’s more like 90 km in length), but it’s still mighty impressive to see. Download the full guide for more details on this route! New Zealand might seem like two small islands with a relatively small population, but do not be fooled. These small islands are mighty fierce! Embarking on a road trip is undoubtedly the most cost-effective, easiest and fun ways to travel around, but here are some top tips you should follow to help ensure you have an amazing and safe journey. When you’re working out which vehicle is right for you consider your budget, the route and itinerary you want to take and your personal preference when it comes to accommodation. if your idea of camping is carrying your suitcase into a hotel room for the night then a campervan might not be right for you. However, if you plan on staying in hotels and hostels then consider that they are in short supply and will sell out in the summer seasons. If you plan on hiring a campervan then one of the plus sides is that you can often ‘freedom camp’, which means you get to cut out paying for accommodation all together! However, you can only legally free camp in certain places – so plan your stops carefully. Check out http://www.freedomcamping.org/ for more details. Start planning your New Zealand road trip by listing out all the places you want to visit and how long it takes you drive between each. If you’re on a tight timeframe then you may need to cut a few stops out – trying to fit too much in will end up with you spending more time behind the wheel and less time actually exploring. New Zealand is small but the roads are often narrow and windy, plus in winter they may be covered with snow and ice. This means you’ll have to take it slow! We recommend you always allow for extra time between destinations. There are lots of places that you can legally free camp in New Zealand, (e.g. pull up the campervan and sleep by the roadside). However, there are also lots of places where it isn’t legal and if in doubt don’t assume it’s ok. It’s a law that’s taken seriously. Remember that in New Zealand you drive on the left. If you’re from the UK then this is the norm anyway, however if you’ve travelled from the US or mainland Europe this may come as a shock. When you’re starting out take it slow and concentrate, (that might mean turning down the tunes or telling the passengers to pipe down!). Driving a large campervan is certainly different to zipping round in the cars you’re probably used to so you’ll be forgiven for driving a little slow. However, if you notice faster traffic starting to line up behind you, pull over and let them pass safely. Welcome to our guides page! All our guides provide plenty of information and have been written by our own staff and experienced campervan travelers throughout New Zealand.